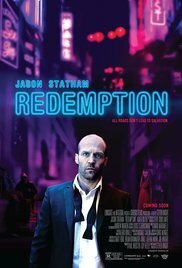 Jason Statham moved upa notch in my book after seeing this movie. He plays the part of a former Special Force soldier who’s suffering from PTS and hides, after committing a war crime (as I could deduce), in anonymous London. He plays it perfectly and convincingly. It surely isn’t an action movie but rather a morbid drama about how someone, with a self-destructive attitude, gets his act together, goes of to search for his companion and ultimately takes revenge. Furthermore he suddenly helps a compassionate nun who has helped him selflessly in all those years. Statham is seen as part of the new generation of hard-hitting action heroes that are a repayment of the old-school veterans. And he makes a difference by playing in this film. Imagine a Van Damme, Stallone or even worse a Schwarzenegger in this role. That would be a ridiculous and unbelievable performance. But Statham fits in this. The few action scenes are sometimes raw and realistic, but aren’t authoritative and it doesn’t occupy centre stage as in his other films. I was fascinated from the start till the end. The performance of Agata Buzek, the Polish nun, was played overwhelmingly. And she’s far from ugly if you look at the pictures on IMDB. She has a natural look and contrasts with that beauty ideal from Holywood. The subtle humor, the flashy action as well as the dramatic portions of the film provide a beautiful and coherent whole. And that was greatly appreciated by me. The moment Joey actually confesses his story to the nun, was for me the most important moment in the film. Then he returns to his previous existence as a nobody in the gutter so that he’s no longer lethal to others. Strong! Prime Choice! Intriguing! Compelling!